Well although my week seemed a little slow to start I am happy to report that I was able to get a good amount of time in the shop. As of my writing I completed 3 different things. 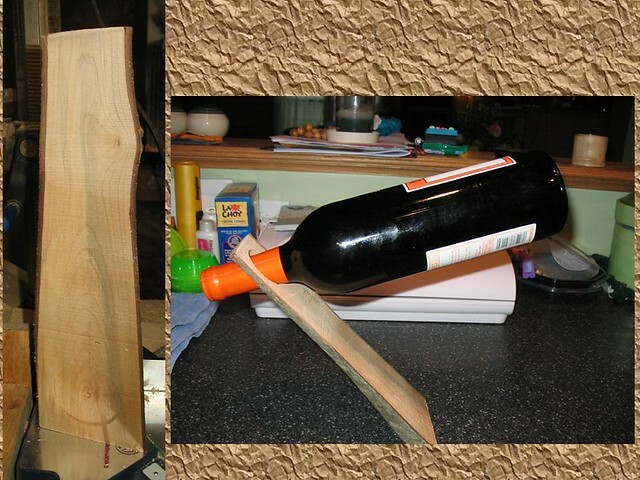 I have been looking at wine balancers a lot lately. Not entirely sure why as I do not drink at all but they seem really cool and I thought it would give me something to do with all of those bottle of wine that people have given us and just sit in our dining room buffet. My other thought on these is to make a number of them from woods found and sell them. That’s whole ‘nother blog though. Here is the first one that I have made. This piece of scrap has been in my bin a little while and every time I looked at it I knew there hade to be some use for it. This one will be going to work for a bottle of Pelligrino Water in our conference room. I have left it completely natural, I am sure I will have to replace it at some point but wanted to get the idea made and go from there. 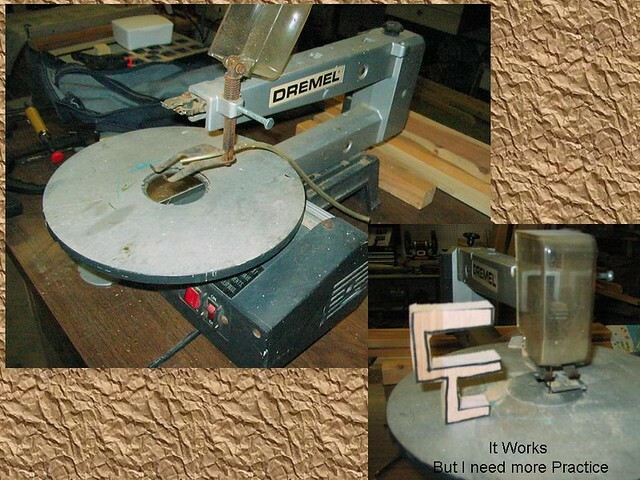 Once I was in the shop I decided to stay there yesterday and try to tune up my new scroll saw. As you can see it is a bit battered, but seems to work just fine. The top knob was missing; and according to the guy I bought it from has been since he got it. The knob for the table tilt was broken and I had to use pliers to remove it. So decided to make some new knobs as I have seen a few LJs make them and wanted to try my hand. Mine are pretty simple and work just fine. 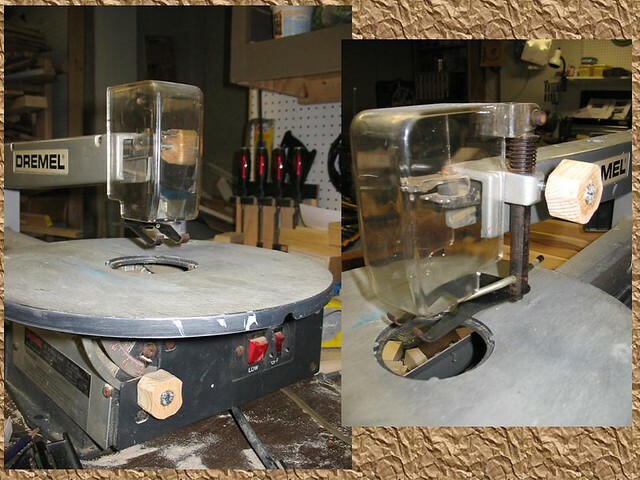 The screws are held in with super glue and then used the edge of the belt sander to make the indentations. A little bit of compressed air, oil and some dish washing (for the guard) and it looks pretty good. My last project of the week took me outside again. 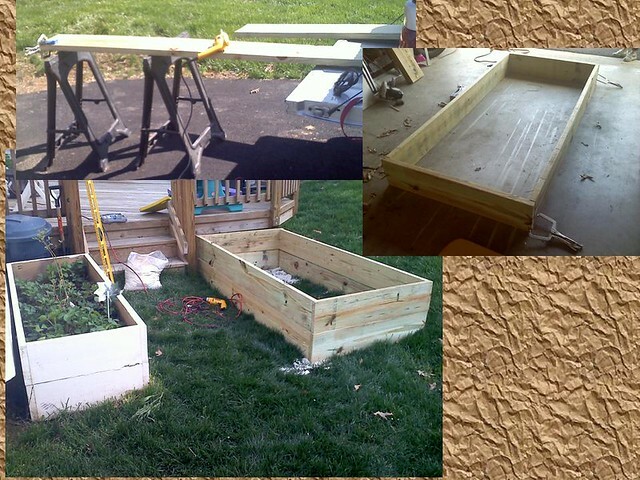 The DW wanted to add a 4th raised bed to the collection. This one is hopefully going to help tame some of the squash and pumpkins that ran amuck in our yard last year. So a trip to the Big Orange for the wood and a quick trip to get a 4th clamp to make my life easier. Some cuts, some Kreg Joints and it is done. The painted box was built 2 years ago and produces a huge amount of strawberries and a few blueberries. Looking forward to both of those crops coming in. All in all the weekend has been quite a productive one. Hope yours was too. Man! That live edge balancer is a beaut. Well done. All is great work. Well done, your woodworking week has been much more productive than mine. I made a beautiful handle for a tool box I dont like. I am going to ditch the box and make one that suits the handle (I haven’t put it all together). The box is just not salvagable (expensive fire wood (at least in time anyway)). On another topic, anything happening in your neck of the woods around mid September. I am taking the extended family on a holiday. We are going to NY & DC. With some touring between the two. Open to any suggestions.